I can’t remember a time when I didn’t get excited about desserts. As a child I always looked forward to the chance to bake for my family and classmates, and it’s turned into a lifelong passion and career. After attending Johnson and Wales University and working in some of Miami’s top restaurants, I was living in Las Vegas and was eager to start a business that allowed me to work directly with my clients to create the desserts and cakes of their dreams. 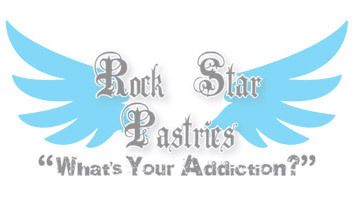 In 2008 Rock Star Pastries became a reality and in the years since its been a whirlwind of sprinkles and creative themes. I’ve had the pleasure of working with so many friends and families, from all over the world, for every kind of occasion and it brings me so much joy to see the families growing through each celebration. My desserts are a reflection of my attitude and style and I love making fun sweets with lots of bright colors and flavors. My philosophy is ‘Life is short, eat dessert first!’ I love what I do and I want to share that with my customers to help them make every event memorable.